Based on the novel by Agatha Cristie, Inspector Hercule Poirot must solve a murder on a luxury train. The cast is outstanding. Kenneth Branagh stars and directs, handling both roles with ease. Also on board are Johnny Depp, Judi Dench, Willem Dafoe, Michelle Pfeiffer, Penélope Cruz, Daisy Ridley, and many more. Everyone looks like they enjoyed slipping into their roles. The cinematography is amazing. The train zipping through the snowy mountains – wow. Plus it boasted some quirky camera angles. The use of camera in a confined location such as a train are really interesting. The story was a clever twist of clues and unique characters, plus there was some quirky fun humor and lines. This film would’ve been a great entry for the blogfest today, but sadly I’ve not seen the original nor read the book, so I can’t make a comparison. It did keep me guessing until the end and I thoroughly enjoyed it. Comes out this week! And for once, I’m not waiting until Friday – I will be seeing it Thursday evening. Until then, enjoy the latest trailer. *11-16 - And it was awesome! Loved the movie. 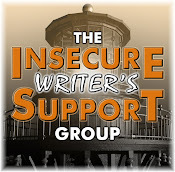 Plus today at the Insecure Writer’s Support Group, our IWSG Show Your Writer Insecurity Contest winner, Ken Rahmoeller, talks about how to deal with writer insecurity. 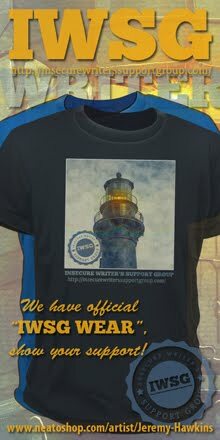 Sign up and visit others on the list below! Two things came to mind immediately when I created this blogfest. 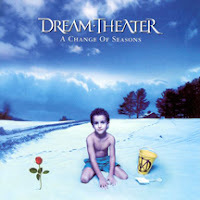 I am a huge Dream Theater fan. When I heard their cover of Elton John’s Love Lies Bleeding, I was amazed. Now, Elton John did an amazing job – he wrote the song. But Dream Theater’s version is just as good. They captured the same vibe while making it a little more rocking. John Petrucci is just incredible with the guitar. And James LaBrie captured the vocals perfectly. I also have a move remake that blows the original out of the water. The Thing From Another World is a 1951 cheesy science fiction/horror film. It’s still highly rated and regarded as a classic. And then, in 1982, John Carpenter dared to create his version of a science fiction classic. Anyone else see Murder on the Orient Express? (Either version!) Ready for Justice League? What remakes do you recommend? And I almost missed it - November 9 marked eight years of blogging for me! I’ll be leaving the end of the week for Thanks giving with family, so I won’t be online beyond responding to comments and Twitter. To my American friends, have a safe and enjoyable Thanksgiving. See you Monday, November 27. Can't believe I got here so early! Murder on the Orient Express looks good. Justice League has me excited, but I'm still holding my breath. I really want this to be good. 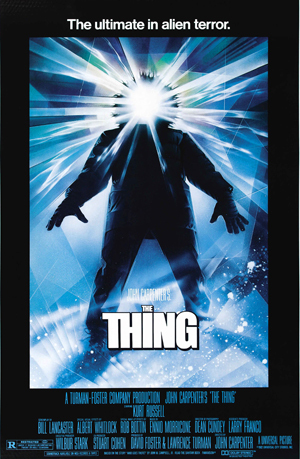 The Thing from '82 is a classic all on its own. Good choice. Thank you for the reco re The Thing! I signed up for the blogfest but have tweaked parts of it according to my limited movie knowledge...LOL! Congratulations on eight years of blogging! Happy Thanksgiving to you and yours, Alex! So glad you liked the remake of Murder on the Orient Express. It has really peaked my interest. I can't believe that you haven't seen the original with all the movies you seen. And that I've seen one that you haven't. It's a really good movie. You should check it out sometime. I've read MotOE, but I haven't seen the movie yet. Thanks for hosting this blog fest! It was nice to do something different for my post today. Have a wonderful Thanksgiving, Alex! Enjoy your break! Christie's movie is a must for me. I've seen the original (there may be a few I think, and a few TV episode adaptations too)! Have to see this as soon as I can drag Hubby there (he's not a Depp fan). The Thing - lol. Great remake choice and the song too, is a beauty! Elizabeth, glad you got to see this one. Was it mystery research? Nila, the book is almost always better, but good to know they still did a good job with the film. Natalie, if I've seen the original, I just don't remember. Sandra, thanks for participating. You got to talk about your Beatles love. Madeline, I want to watch it again as well. Happy Thanksgiving and thanks for hosting another amazing blogfest. I've been hearing that Orient Express is a great movie but people are disapointed by the ending. I assume they changed the orginal/book? Dream Theater is awesome, and Elton John writes excellent cover song material because he writes good SONGS, which can be adapted to any style or genre. Thanks as always for hosting! I can't wait to see Orient Express. I loved the original. Thanks for organizing this fun blog fest. So the mustache wasn't super distracting? The Thing was a good one indeed. Thanks for the info on Murder on the Orient Express. Sounds like an interesting film. Enjoy your time with family. Happy Thanksgiving! Would like to see this remake of "Murder...." Wonder how much different is it from the original. 'Thing' is also an attraction. Remembered that one too, quite some time ago. Justice League, please wow us, please. Murder in the Orient Express sounds like a good film. I need to also see Thor film. Remakes done well are a marvel to behold indeed. Take care, Alex. CD, I have no idea if they changed it or not. I was satisfied with the ending. And you get bonus points for thinking Dream Theater is awesome. Charles, if it's on, I'm hooked. Christine, that must've freaked you out at that age. Pat, they enjoyed poking fun at it. I'm glad you liked the Train movie. I read the book so long ago, I barely remember it. I like your choices. That is a great Elton John song and DT did a great cover. I didn't watch either Thing movie, but didn't Kurt have great freakin' hair??? Have fun with all the remakes! The Thing was one of the first horror films I really got into. Until then, I didn't like them although I was fascinated with the special effects. Congrats on 8 years of blogging. As usual, I haven't seen any of these. I watched The Wizard of Oz last night. Yes, I'm still a kid at heart. Have a wonderful Thanksgiving with your family, Alex! And congratulations on eight years of blogging. Take care! I have seen the original movie, Murder on the Orient Express. I'm looking forward to seeing the new version and hope it's as good. Happy Thanks to you and your Family!!! Murder on the Orient Express has piqued my interest but I try to read the book first before watching the film adaptation. So it'll be awhile until I watch the movie. Speaking of remakes, I just remembered something. Buffy the Vampire Slayer came out as a movie (kinda sucked but still enjoyed it)first. Then was remade as a TV series which I LOVED. A slayer in love with a vampire and her town is sitting upon a hell mouth. Can't get any more angst than that. Can't wait for JL. Hopefully the movie does as well as Thor and lives up to its hype. Can't wait to hear your thoughts about it. Congrats on the eight years! I can't think of any remakes at the moment which were worth seeing. Have a wonderful Thanksgiving! We enjoyed "Murder on the Orient Express" as well. Just a gorgeously shot film. It did deviate from the novel a bit, but overall very nicely done. The Dream Theater remake is indeed outstanding. This is on one of the two Dream Theater albums that I own. I'd say their version is better than Elton John's. Both versions of The Thing are very good. It's been a long while since I've seen the remake, but I've seen the original a couple times in recent years. Great film. Thanks for hosting the blogfest. This one I couldn't resist since I have a bit of a soft spot for things like this. I think I'd love any remake of that Agatha Cristie story. Great choice. I haven't seen either Thing movie, or heard either of those songs. Murder on the Orient Express looks like it would be fun. It's been years since I've read the book. Murder on the Orient Express looks interesting, but we can hardly wait to see Justice League. thanks for hosting the blogfest. Congrats on eight years of blogging! In terms of remakes that I likes, I thought the remake of Battlestar Galactica was great. So much better than the original. Have a wonderful Thanksgiving with your family. This is showing my dinosaur tastes, but one remake I really liked was Tyrone Power's remake of Douglas Fairbanks, Sr.'s Zorro. I'd also love to see Lon Chaney, Sr.'s sound remake of his 1925 film The Unholy Three, other than a few clips. One of the advertising taglines for that film was that the man of a thousand faces was now the man of a thousand voices. Congrats on NINE years of blogging. Such a rarity these days. I do hope Justice League is at least pretty good. It doesn't have to be amazing. Just good is all I ask. I had no idea there was even a 1951 version of The Thing. The 1982 movie is first really scary movie I ever saw that I loved. My movie list keeps growing. So much goodness coming!! Hey, happy belated blogoversary! I never realized that your blog was born on the same day I was. I'm in good company there. I've never been much for mysteries, but I do really want to see Murder of the Orient Express. I'm not as excited about Justice League, but I'd be willing to give it a chance. There's no comparing the new version of Murder on the Orient Express with the version from the 70s. Try and see the version with Albert Finney and I think you'll agree. John Carpenters Thing froze me with terror when I first saw it. The idea of a monster assimilating humans with ease was a game changer for me when going to bed at night. I'm looking forward to the remake. Heather! Kurt Russell has always been awesome. And ready for Justice League to rock. Thanks, Lidy. Yes, teh Buffy movie was just all right, but the series was much better. Kind of like M*A*S*H.
Lee, you rock! And knew you couldn't resist this blogfest. MJ, you've never heard the Elton John version? Jay, it is supposed to be good. Bryan, I picked a good day to begin then. Stephen, I'll have to watch it. Spacer Guy, ever think your parents were aliens? I’ve never watched Thing. I would like to see the original and the remake, though. Hubby has watched The Thing, but I haven't because I'm a horror wuss, so I don't do horror movies at all. sounds like this movie does justice to Agatha Christie's book - a worthy read. We saw Thor this week - super good fun. Eager for Justice League. Glad we are ramping up in holiday season. I've read Murder on The Oriant Express and seen the old film version and can remember whodunnit, so I'm not sure I'd fully appreciate the new version. Thank goodness for worthy movie remakes. I'm interested in doing some hoping to find out what others have picked. Happy week to you and yours. My bookaholic self always prefers the books. We're averaging a movie every weekend (Thor yesterday and It the week before) and will be seeing Murder on the Orient Express this Saturday. Wifey picked up movie tickets at Costco this morning and looking forward to seeing it. Enjoy your holiday and stay safe! I plan on seeing Murder on the Orient Express the day after Thanksgiving, with the whole family. Glad you gave it a thumbs up! And no, I've never read the book or seen the original movie, either. I just hope my 11-year-old granddaughter will enjoy it. Murder On The Orient Express is on our to-be-seen list. Glad you enjoyed it. Hope you've had a productive day and have a pleasant evening. I am excited about Murder on the Orient Express. I haven' t seen a movie in the theatre in years, but this one might be the one to get me there. As for remakes in general, typically I like whichever I have seen first. It gets into my head as the way it is supposed to be, and the other always feels a bit wrong. It's so funny you talk about Murder on the Orient Express. I thought everyone new that one (I did, so in my mind everyone else did)--classic twist! I was not familiar with the originals or remakes, but I am looking forward Murder on the Orient Express and the Justice League. I am however a big Elton John fan so surprised I was not familiar with the song. I remember reading about The Thing. Fans loved it and the original trailer is a classic. I must have seen Murder on the Orient Express at some point. I remember the story. Definitely want to see the remake. I'm still undecided about Orient Express. Patricia, that one might give you nightmares. Joanne, showing my age in that I remember the Hayley Mills one well. Stacy, how well does she follow a British accent? Juneta, it's an older song. I forgot that The Thing was a remake. It's definitely one of my all time favorites and yes, those special effects do still hold up, don't they? I'm always impressed when I re-watch. The Thing was a superb remake! And I did see the older Murder on the Orient Express years ago, but for me nobody has ever played Poirot as well as David Suchet. The new Murder on the Orient Express has such an amazing cast I'm definitely going to need to check that out! 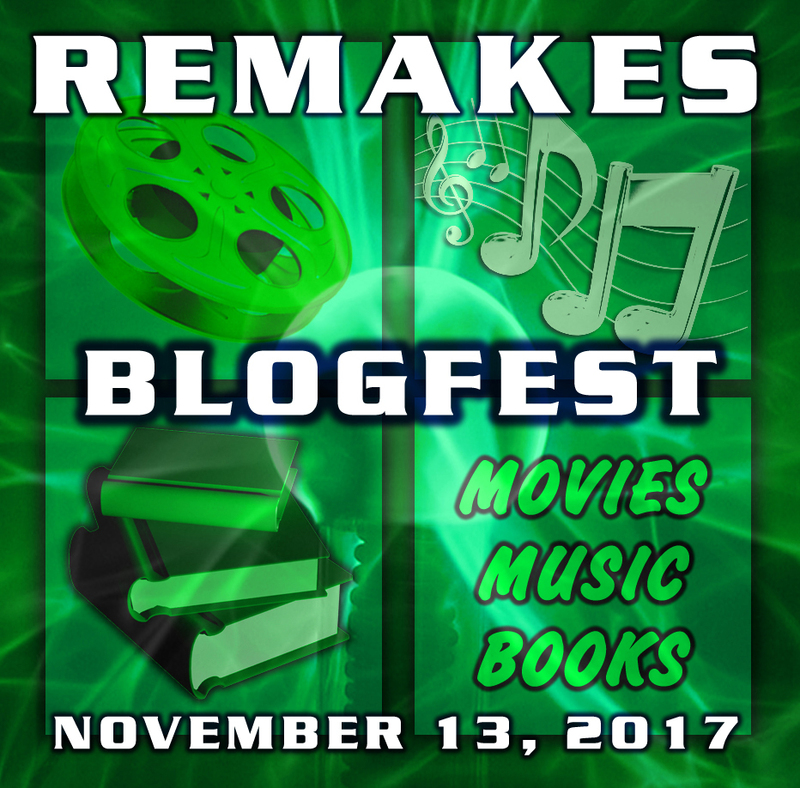 Great choices for the blogfest! And eight years of blogging? That's impressive! Congratulations! I am ready for Justice League. I remember how tense The Thing was the first time I saw it. Enjoy your Thanksgiving. The Thing seems to be a popular choice. I may have read Murder on the Orient Express. I went through an Agatha Christie phase. I don't recall it, though. Her books are pretty good, so worth it if you're in a mystery mood. First, Congrats on eight years of blogging. You have touched so many lives in that time. I enjoyed the Dream Theater clip, this touched me somewhere deep inside. Hauntingly beautiful. You have so much to be Thankful for may it always be so! 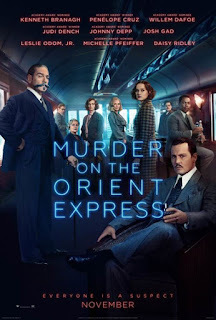 I saw the original Murder on the Orient Express years ago -- a long enough time for me to forget the details and mood, and that's good because I really want to see and enjoy this new version. It's looks like elegant, sophisticated fun. About a month ago I started reading the book very slowly in French (but with my trusty English version on hand). I certainly won't be able to finish it in time since I want to see the movie NOW, but maybe this will inspire me to keep at it. I've read Orient Express, but I don't think I saw the movie. The only Agatha Christie movie I'm sure I saw was Ten Little Indians with Frank Stallone, because I was a pre-teen and blown away that Sly had a brother. I recall seeing an earlier version of Murder On The Orient Express but that was many years ago. A great film also great to read. Marcy, they were just as good as the 'sequel' a couple years ago. Probably better. Erika, glad you saw it! Helena, if you don't finish the book before you see the movie, at least the ending will surprise you! Shannon, I didn't know he had one either. Thanks everyone and have a great Thanksgiving! I would love to see Murder on the Orient Express. It looks like a lot of fun. Congratulations on your blogversary and happy Thanks giving. Normally I don't like remakes if I liked the original. But you've made me want to see Murder on the Orient Express. Haven't seen Murder On the Orient Express, but hubby and I thought it looked good. Now that you've recommended it, we'll have to go see it. I started watching the trailer for The Thing and it's too scary for me! Eeek! Fun blog post, Alex! I'm looking forward to Justice League, but I don't have tickets yet. I really want to see Murder on the Orient Express because I've read the book and I think I may have seen the original film ... there was one, right? I started blogging (but not as frequently as you) in 2009 so I'm at that same point as well. I'm trying to get back into it after a difficult year trying to find time for writing. Happy 8 years Alex! Thanks for the review on Murder on the Orient Express. I have never seen the old one. Have fun watching Justice League! Happy Thanksgiving! Tyrean, yes, there is an an older film. I've never seen it though. DG, I'm sorry. That sounds challenging. Your review was awesome on Murder on the Orient Express. Believe it or not I have never seen this movie much less the old one. Happy Thanksgiving & sorry for being so very late. If I see the new Orient Express it will be because of the cast. 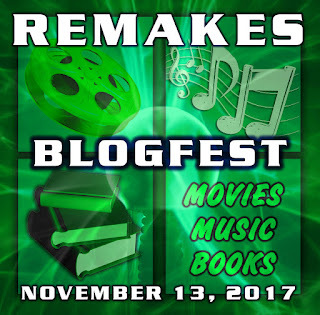 Love the remake blogfest idea. I am looking forward to the Justice League! I hadn't heard of the Murder on the Orient Express remake, but I'd definitely love to see it. Sounds awesome. Loved The Thing. What a deliciously creepy, disturbing movie. Happy blogging anniversary, and Happy Thanksgiving! I'm excited to see Justice League too. If it is here on Thursday, I might surprise my son and take him then (on a school night, what?!?). :) We'll see how late it runs. I'm looking forward to Orient. I read the book, and it was fabulous. Orient Express and Justice League are definitely on my must see list. I have always relished films set aboard a train, even the teen body-count flick Terror Train that stars Jamie Lee Curtis. I like films of any genre that are cleverly laced with humor. Seems you and C-Lee and who knows how many others agree with me that the remake of The Thing is excellent. There again, humor added to the enjoyment with lines like "You gotta be f--kin' kidding!" peppering the dialogue. Thank you very much for your kind words during my bereavement, good buddy! I'm excited for Justice League too. Because of your review of Murder on the Orient Express, I may just go and see it now. I've been looking for something in this vein to get my brain working. Oh my gosh, I came back to wish you happy holidays and don't eat too much. I wish you and yours a very thankful Thanksgiving. I pray the Lord bestows upon you and your family good health, love and happiness this year and every year! Have a good time! Just one thing I watched your video of "The Thing" OMG I haven't seen that one in years. Kurt Russell was a youngster in that one. Now I see why Goldie Hawn dated him & stayed. hubba hubba bwahahahahaha Be safe on your trip!!! Ooops! I forgot to tell you... I'll save a slice of pie for you if you come and get it! LOL You're a good friend Mr. Cavanaugh !!! Thank you for your friendship! The Orient Express looks like such a fun movie! I'm looking forward to seeing it eventually. Have a wonderful Thanksgiving, Alex! I've never seen either movie of Murder on the Orient Express. I've read the book, though. The new movie sounds good. Maybe if I have some time, I'll watch it. Have a great holiday with the family! I saw an old Murder on the Orient Express along time ago. I love the story so can't wait to see the new release. Congratulations on the 8 years, Alex! What a wonderful journey it has been. I'm afraid I missed the blogfest--am not very good about remakes etc. Thanks for always being such a huge supporter--my blog will turn 10 next year, January, and I can't believe it! Maria, go see the new one then! Rosey, go for it! I am. Shady, that was a great line. And good to have you back with us. I know it was beyond difficult. Michael, you need to take your brain! Marie, thank you! I like pie. Damy, wow! That is awesome. Enjoy your family getaway and Happy Thanksgiving, Alex! The cast on Orient Express is absolutely daft! Wow. Have fun on your Thanksgiving! I was surprised that my youngest wants to see Murder on the Orient Express. They were reading it in high school but never got to finish it because they got sick and missed much of the book so are very curious how it turns out. Of course, now they want to finish the book before seeing the movie. Interesting reviews. Quite the cast for Murder on the Orient Express. I haven't read Murder On the Orient Express Yet, but my kids have read it as part of our homeschooling and all three of them loved it. I'm glad to know the movie is high quality! Dream Theater is a favorite of my husband. I like them, but LaBrie's vocals wear on me after a while. Hubs says he's more listenable when he's doing covers and not creating his own lines, lol. Happy anniversary! Your blog has certainly touched a lot of lives online. Celebrate. And have a blessed Thanksgiving with safe travels. Elsie, you need to take your youngest then. Gary! Good to hear from you. Lynda, thanks, and your husband rocks. I haven't seen them yet, but plan to see both of those new movies. We tried to go to Justice League last night. It was SOLD OUT! We will try again today. I can't wait to see it. Thor and Orient are on our list. Life has been interfering lately with our movie dates. Hope you and Mrs. Alex enjoy your weekend. Glad you enjoyed Justice League! The Thing shows that just because a remake was good, doesn't mean another remake will be. Rosey, hope you got to see it. Nick, the next one wasn't nearly as good. I was slow to admit that Poldark is an excellent remake. I loved the Emma Thompson's version of sense and sensibility, but with Hattie Mohran and Dan Stevens as Eleanor and Edward, respectively. Wonder Woman sadly seemed predictable, disappointing and derivative. Lucy Davis' character was the best but we hardly saw her, sadly. Ha! I had actually planned to do The Thing remake as my talking point last week, but felt it was almost too predictable given my status as doing horrors and thrillers. I keep hearing from fans that JL was good, and I'm glad for that - I've always been a Marvel fan, and I love the movies, so I'm glad to see DC fans getting movies that they love too. ^_^ Hope your time with family goes well. I saw Orient Express and liked it. I hadn't read the book, but I thought I'd remembered who the killer was based on anecdotal evidence. Glad to hear Justice League was good. My daughter has been hearing bad things about it. Hopefully her sources were wrong. I was always more of a DC than Marvel fan. Posting from my phone. Not fun. I hope to see Murder and Justice before they leave the theater. I'm not good at seeing movies alone though. I saw Thing as a kid. And the remake with Kurt Russell. First movie I saw Kurt in not as a teen. Still one of my favorites. Backdraft is likely my fav Kurt movie though. Always liked the title, Murder on the Orient Express. I'd like to see the movie. Hope you've had a wonderful Thanksgiving. Robert, it was a really popular choice that day. Mason, it was awesome! My review goes up tomorrow. Ken, ignore the critics. Tell her to go see it. Rosey, both were good movies! Donna, I like most of Russell's films. Big Trouble would be my next favorite. I have been so busy...and exhausted that I missed your post. I have to admit, I like the original The Thing a bit better as the remake was gory as hell. I love the original Murder on the Orient Express and will see the remake but I have a feeling it will not measure up. Thanks for the shout out, Alex! Ooh, neat. I *have* read Murder on the Orient Express, but I never remember whodunit. Will have to check out the movie!